I just can’t help saying, for God knows how many times now, that I just love mushrooms. I love mushrooms! This particular type of mushrooms, also known as maitake mushrooms, or ram’s head or sheep’s head mushrooms for English speakers, it’s a major culinary ingredient in Japan. Maitake is also used in Chinese and Japanese medicine as a regulator for blood pressure, glucose, cholesterol and insulin. The hen of the woods or maitake is very rich in potassium and vitamin D and it tastes amazing so if you can find it ( I suggest looking it in Asian stores ) it’s a great ingredient to work with. 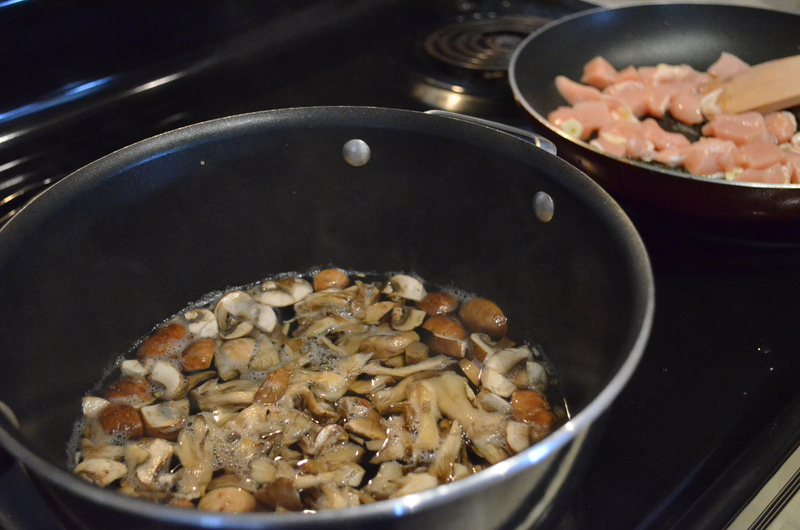 Cut the mushrooms in smaller pieces and bring them to a boil in about 1.5 l water. Cut the chicken breast in small pieces and saute it in olive oil together with the garlic. Now we need to make the white sauce (which will not be white because we will be using the warm water in which we boiled the mushrooms). I made this sauce using about 4 tbs sunflower oil (can also use canola or even butter) and about 1/4 cup white flour. You heat the oil in a frying pan on low heat, add the flour and stir with a wooden spatula. 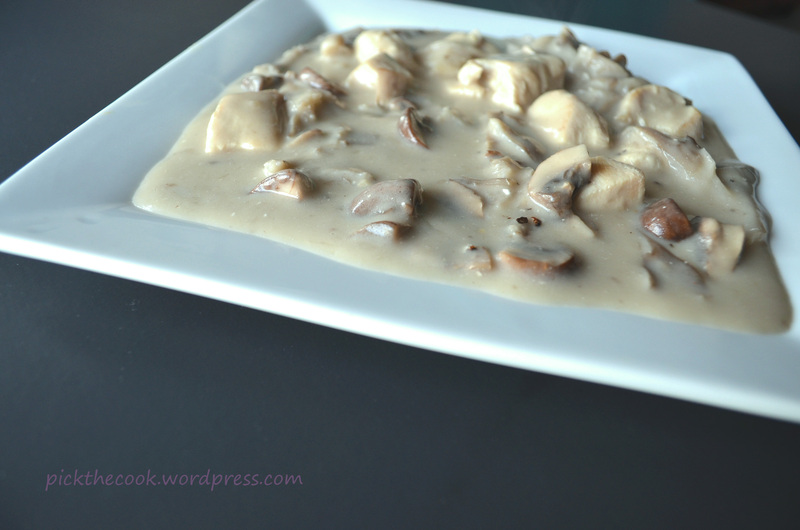 After incorporating the flour (no more than a few seconds of stirring) you add 1/2 cup (a ladle) of mushrooms soup (remove mushrooms form water and use to make sauce) and stir energically. When soup incorporated add another 1/2 cup to the sauce and stir well to prevent lumps. 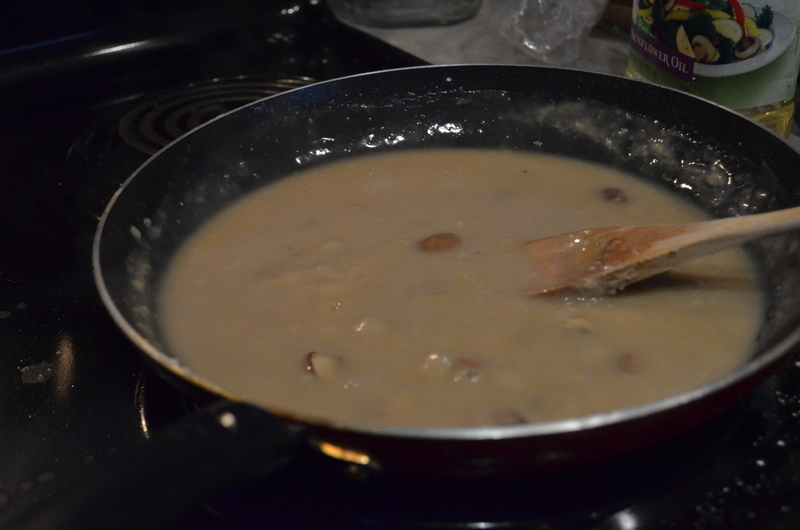 Continue adding soup and stir until your sauce has the consistancy of a bechamel sauce. 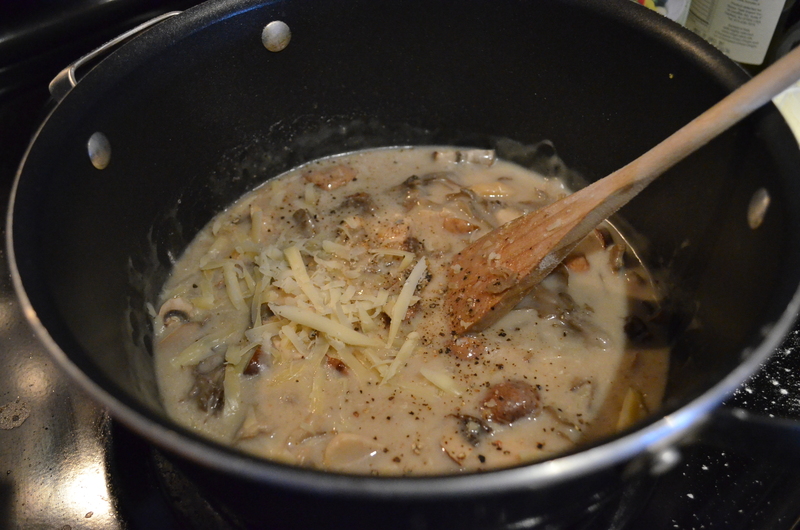 Add the mushrooms and the chicken to the sauce. Salt and pepper everything to taste. Add the sour cream and grate as much cheese as you like into the sauce (I might have used about 1/3 cup). Mix well and let it cook on low heat for another 2 -3 minutes.